We are aware that organisation plays a large part in ensuring operations throughout all aspects of our lives run smoothly; but the benefits of careful planning and preparation go far beyond their own physical results. Confidence is largely built on several strategies like thinking positively, hitting goals, getting to know yourself, facing your fears, taking action, displaying gratitude and not fearing failure. Behind all these techniques comes preparation; and today we’ll be looking at how careful but simple organisation can boost your confidence and set you on your path for personal victory. So, what is preparation and why is it so important? Preparation can be anything from simple administration tasks whether for home or business, deciding what to wear on a daily basis, keeping a schedule or task list or having allotted time each week to spend on a specific duty. The steps you already take with these reoccurring actions can be utilised to enhance each aspect of your life. Let’s have a look at a common example each of us can relate to. There are those of us who dedicate a select amount of time to preparing all our meals for the coming week. Knowing that the task has dedicated hours which will save us time in the long run means we don’t have to think about that task for the rest of the week once it’s completed. So how does this improve confidence? If we look at the steps taken in the above preparation flow; you’ve already achieved three different things by the time the task is done. You’ve prepared what you need to complete the task. And you’ve put that task into action. Now, not only can this task now be pushed to the side; leaving more time to focus on other priorities, but you have now a sense of achievement. There are numerous studies out there which prove achievement and hitting goals directly influence our self-esteem and therefore confidence levels. Switching our minds between seeing everything on our To Do Lists as an “annoyance” to “something I can achieve” comes back to one of our first two points of confidence – Thinking Positively and Hitting Goals. Seeing our daily or weekly schedules can be daunting, leading to procrastination or avoidance; ending up with more stress than any of us need. Say you have a very important business meeting that you must present some findings at. You wouldn’t go into this meeting without the notes you’ve prepared, and you wouldn’t have those notes without preparation. Imagine going into this meeting blind, without anything. The room stares at you as you try to remember what was on your computer screen before you left your desk. Your face is turning red with embarrassment. This meeting isn’t going well at all. Of course this would be a direct hit to your confidence. You know the information and have done extensive work into it, but the others in the room aren’t seeing this. They are seeing that you haven’t prepared properly and are lost for words. Scheduling an hour to prepare before the meeting could have saved this inevitability. Let’s look at the flip side of this. You’ve scheduled in preparation time an hour before the meeting. You go in with your notes, knowing exactly what you’re talking about. Everyone’s head is nodding in agreement, your presentation is flawless. Your boss shakes your hand and tells you what a fantastic job you’ve done. And whilst we should be looking inwardly to gain our confidence, and not from others; a pat on the back from the people who can see how hard you’ve been working never goes astray. If we take this process and add it to each element of our lives, with just a little preparation time each week we are not only taking responsibility for ourselves but indirectly building our confidence a little each day. Writing down your task list for each day or preparing notes gives you something to refer to back to. Take a moment for yourself each time you cross something off that list and feel that internal sense of achievement. Aim to not become overwhelmed by your preparation. Remember, this is meant to make your life easier, not harder. If you find a system that works for you, do it; whether that be dedicating each Sunday to all your preparation for the week or scheduling time for your bigger priorities. Got out of bed today? 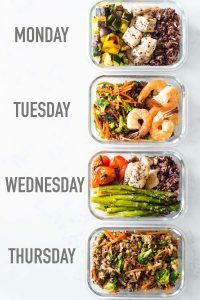 Did your meal prep for the week? Got through a task you’ve been procrastinating over for ages? WELL DONE! GO YOU! YOU’RE A WINNER! Don’t forget, celebrating small victories will motivate you to continue with other tasks and start to enjoy the process of preparation. Give yourself small rewards like a nice lunch or buying yourself something small that makes you happy reinforces that sense of achievement especially for activities you don’t want to do. Bribing yourself can be an effective tool in Getting Things Done. Still finding it hard to get motivated? Maybe it’s time to shake it up. If you’re finding yourself stuck in a preparation rut, try something new. If you’re already a master of making lists, challenge yourself to memorise everything on it and really get that brain working. If lists don’t work for you, find something that does. Put reminders on your phone for time you’ve scheduled to work on something, or enlist the help of an organised friend to get that diary of yours in order. And finally, there is a lot to be said for “Faking it until you make it”. Act like a well-prepared person, and slowly but surely you will start to become one.